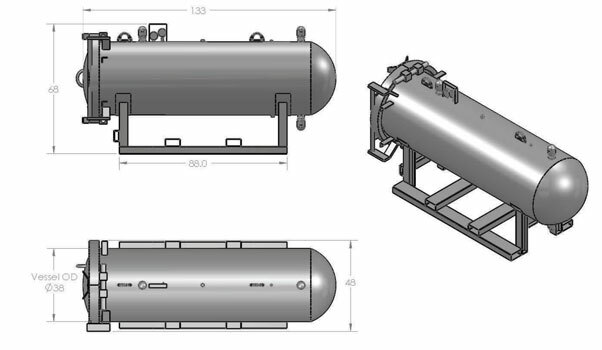 The ECO LP-38 is a DOT-exempt salvage cylinder for transport or storage of leaking, damaged, or deteriorated compressed gas cylinders. 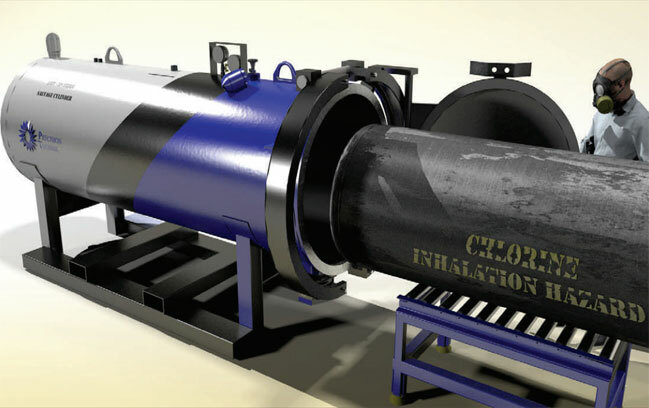 The unit was designed to address the transport needs of large diameter vessels, specifically 1-ton and Y-cylinders. Fabricated of carbon steel to ASME Section VIII Division 1 standards, the vessel has a working pressure of 450 psig. Gases and liquids released inside the salvage cylinder can be withdrawn via one of several universal fittings and then directed to an appropriate scrubber or repackaged. The ECO LP-38 vessel weighs approximately 5,500 pounds and is easily moved using a standard forklift. It can be used for routine, secure transport of cylinders containing hazardous gases or in emergency response situations that require rapid containment of a leaking or deteriorated cylinder. The closure hatch can be operated by one person, even when fully attired in chemical protective equipment. Additionally, the hatch is equipped with safety devices that prevent the vessel from opening when it is pressurized.